Accidentally purchased a little quadcopter and then found that the expensive ones have come down in price since I last looked. These videos look much better on YouTube at 720p full screen. 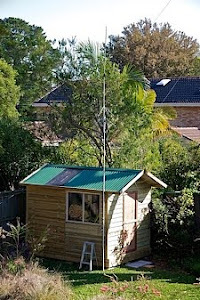 You can see my 20m vertical on a squid pole on the balcony at the front. It's running my WSPR station. I bought a Quattro-X which can easily lift a camera and has the advantage of GPS stabilisation so it's not too hard to control even when there's wind. A surplus of trees does lead to some messy landings however. The quadcopter is getting pretty beaten up.